Livliga® Live Vibrant Blog: Hoisin-Grilled Chicken with Soba Noodles-EASY! My family loves Asian flavored foods. My daughter particularly loves dishes with Asian noodles. 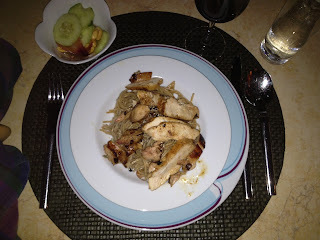 When I saw this Hoisin-Grilled Chicken with Soba Noodles recipe (371/cal) I had a feeling my family would like it. In fact, it turned out to be a great summertime meal that was easy to prepare. The only tricky part of the meal was finding the sambal oelek (ground fresh chile paste) which is one of the ingredients. I did end up finding chile paste at the grocery store after some searching. To make it a meal I fixed the suggested Cucumber-Peanut Salad (52/cal). Total calories for the meal are 423. It was a big hit and a definite repeat.